One name on the Tottenham Hotspur Ladies team sheet which will be familiar to all Yeovil Town Ladies fans is Sarah Wiltshire. In two spells at the club, the prolific striker scored 26 goals for the Glovers and was a firm fans favourite. She signed for newly-promoted Tottenham in July last year and has scored seven goals in 17 appearances so far for her new side. Sarah will no doubt receive a warm reception at the home of Yeovil Town to thank her for her incredible contribution in green and white. A lot of fans are looking forward to seeing her return. With regards to Spurs, they have had a positive start to life in the Women’s Championship beating London Bees 2-1 last Sunday and winning two bonus points against Crystal Palace and Brighton after two respectable draws in the Continental Cup. 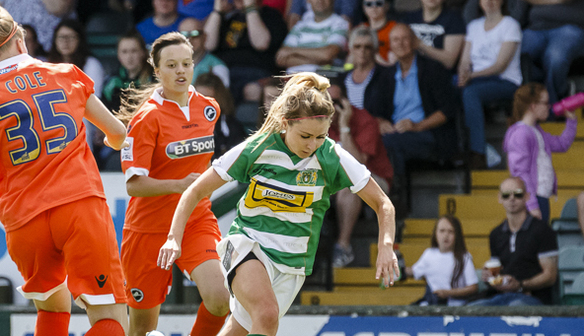 Yeovil have had a tough Continental Cup campaign so far after they ground out a 1-1 draw at London Bees but couldn’t seal the bonus point in the penalty shoot out. The Glovers then hosted Crystal Palace here at Dorchester Town and despite a dominant performance, they cruelly lost 1-0. This will be a tough test against a strong Championship side but Lee Burch and his players are keen to get the first win of the season under their belts on Sunday. Things don't get much easier for the Glovers with Spurs' North London neighbours making the trip to the Clayson Stadium on Wednesday. You can book tickets for both matches here.